Everywhere we look, we see and hear that the world is now on the verge of 5G, or fifth-generation, wireless communications. 5G will be a game changer in wireless telecommunications, ushering in a high-speed network that forms the wireless backbone for technological advances such as connected cars, smart cities, and connectivity for researchers and innovators to a myriad of smart devices operating in the Internet of Things (IoT). Since we at ORION enable ground-breaking research in these sectors, and connect such expertise to the intelligent communities and other institutions who wish to test them, we have been watching this space with great interest. That’s why we were very excited by the Monday’s announcement of ENCQOR, a $400 million public/private partnership between the governments of Ontario, Quebec, Canada and five world leaders in digital technology: Ericsson, Ciena Canada Inc., Thales Canada Inc., IBM Canada and CGI. The partnership will bring pre-commercial 5G wireless cross-provincial test beds to businesses, researchers and innovators operating along a corridor between the two provinces. The project is made possible in part by funding from the Canadian government and the provincial governments of Quebec and Ontario. It will be coordinated in Ontario by Prompt and Ontario Centres of Excellence (OCE). CEFRIO will coordinate in Quebec. Using a collaborative approach, ENCQOR will see small- and medium-sized enterprises (SMEs) engaged in projects together with industry partners in order to accelerate the development and adoption of transformative technologies that allow Central Canada to build the backbone of the next generation of digital infrastructure. When he introduced the partnership, Federal Minister of Innovation, Science and Economic Development Navdeep Bains promised the initiative will focus on research and innovation in the field of 5G disruptive technologies, on adoption initiatives, and on system uses by bringing together a wide network of SMEs, industry, government, and researchers in both provinces. Commercial 5G is coming. We know that the major players in in this field are developing and testing the technology. When it does, we need products that are ready to make use of it – we need to be ahead of the game, just be in the game. The ENCQOR partnership will provide organizations the means to develop and test their innovations on pre-commercial 5G wireless infrastructure. Because of it, our innovation ecosystem can be ready for a 5G world. In this new world, we will connect seamlessly via real-time video and augmented reality; smart cities will improve traffic flow through connected and autonomous vehicles operating with real-time data; smart health technologies will allow patients to be seen, diagnosed, and even operated on by doctors located anywhere. Studio 1 Labs is just such a company who would benefit from such network innovation (and they just happen to be speaking at our upcoming THINK conference about the partnerships that have been instrumental to their own development). 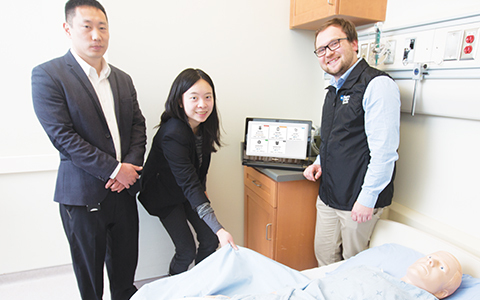 They’re a healthcare innovation company that has developed a bed sheet patient monitor with their own fabric sensing technology. Without any attachments to the body, the intelligent bed sheet collects health data and streams to the cloud to detect clinical endpoints such as respiration quality and heart rate. “Studio 1 Labs is excited to hear about the announcement of 5G technology. 5G will greatly enhance the connectivity of our intelligent bed sheet, providing users with better user experience, system performance, and real-time monitoring,” says Olivia Lin, CEO and Co-Founder of Studio 1 Labs, about Monday’s announcement. We are particularly interested in ENCQOR’s partnership model. It appears to share our own principals of fostering collaboration, supporting innovation, and encouraging social as well as economic development and well-being in Ontario and for Ontarians. We welcome more of this kind of thinking to our community and look forward to the benefits we will all share.